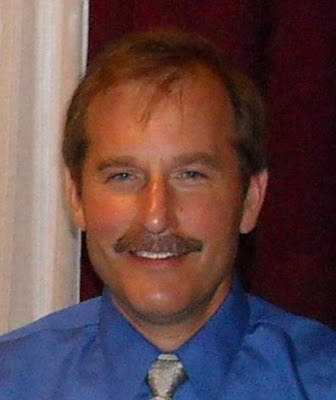 As the wife of a First Officer pilot, I’ve felt some disappointment about the reduced media bravado for First Officer Jeffrey Skiles. His role in the successful splash landing on the Hudson was just as vital as Captain Sully’s. A CA/FO relationship must be a well-oiled machine, as any pilot will tell you. “Pilot flying” and “pilot navigating” responsibilities are typically reversed on every leg of a trip. As I was looking for pictures to add to this posting, there were very few picture of Skiles alone. 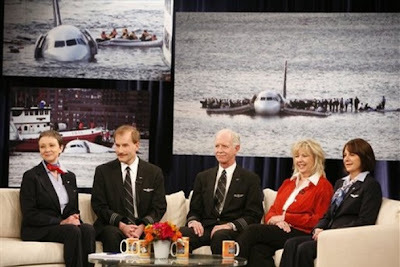 Most were taken with Sully, or with the flight crew. I bring this up not to diminish the importance of a well-functioning flight crew, INCLUDING flight attendants. 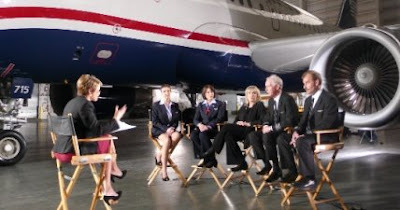 I wholeheartedly acknowledge the efforts of US Airways 1549 flight attendants Donna Dent, Sheila Dail and Doreen Welsh. They brilliantly followed the safety procedures to assist the 150 passengers to safety. My heart goes out to flight attendants in general, who must deal with unruly passengers and threatening situations in a big metal cylinder day after day. I’m really glad that the media coverage post-accident has included the whole flight crew, but a little ticked off that the “FO got the shaft”(in the brilliant words of one of my FO friend). Yesterday, Skiles gave an excellent speech at the Committee on Transportation and Infrastructure, Subcommittee on Aviation, U.S. House of Representatives. Other than TV stations cutting Skiles off after Sully completed his remarks, the address in general was fantastic. Skiles echoed Sully in many of the issues found in US aviation. I will now quote part of his address. Like each and every one of my fellow professional airline pilots and flight attendants, I realize that flying a commercial airliner is a tremendous responsibility. The aftermath of this incident has brought forth in me a renewed understanding that this is a job for experienced professionals. Being an airline flight crewmember, whether pilot or flight attendant, is a serious job for serious people, and I am tremendously proud to count myself among their number. The dedication, seriousness and professionalism with which we in the aviation community approach our responsibilities can be credited for the dramatic improvement of our national aviation safety record. The training, procedures and tenets of cockpit resource management (CRM) developed throughout the airline industry over the last 15 years, played a significant role on January 15th. Training departments industry wide are ceaselessly striving to identify future problems and develop procedures to combat them before they occur. A functional self-disclosure safety program is a valuable tool to identify and track errors. Mutually agreeable solutions to make these programs available are in the traveling public’s interest. We must work tirelessly to maintain an unrivaled commitment to safety and professionalism. However, another component of the positive result was the vast experience of the cockpit AND cabin crew. Along with Captain Sullenberger, I have concerns for the future of the Airline Pilot Profession. Experienced crews in the cockpit eventually will be a thing of the past. What this country has experienced economically in the last 8 months, we have experienced in our industry for the last 8 years, since 9-11. In the wake of these 8 years of financial turmoil, bankruptcies, layoffs, and revolving door management teams, airline piloting careers have been shattered. I personally earn half of what I once earned, AND I have lost my retirement to a PBGC promise that will pay pennies on the dollar. Many pilots like Captain Sullenberger and myself have had to split their focus from the Airline Piloting Profession and develop alternative businesses or careers. I myself am a general contractor. For the last 6 years, I have worked 7 days a week between my two jobs just to maintain a middle class standard of living. The more than thirty thousand people who work at US Airways are proud of the work they do each day, and of their accomplishments. To many of us, the near total devaluation of our professions by our management is heartfelt. In the last several years the only constant I see is the ever increasing compensation levels of our management. When I started in this industry there were aviation dynasties. Entire families would be employed in aviation as pilots, flight attendants, mechanics or agents. An aviation career was something people aspired to their entire childhood, as I did. Now I know of NO ONE who encourages their children to enter the airline industry. I would respectfully urge members of this subcommittee to work with other relevant committees to promote better balance between airline management and airline employees, especially in the area of creating an environment for efficient and effective negotiations inside the National Mediation Board process, thereby eliminating years of negotiating stagnation. I believe the reforms being considered by the House Judiciary committee can lead to more cooperation and less confrontation. This in turn would certainly help to rebuild an environment that will allow us to concentrate on the safety of the traveling public. Our colleagues in this industry have rallied around our incident. While Captain Sullenberger and I generally prefer to land at airports, we are proud that the Hudson River landing displayed what well trained, professional pilots and flight attendants can do when faced with tremendous adversity. We are all very gratified and moved that our colleagues in the flying industry have seen this incident as a positive reflection of themselves and our shared profession. We must ensure that America’s proud aviation traditions of transporting our citizens with safety and security does not fall victim to the immense challenges we face. In this, Congress has a role to play. We hope that you will take seriously the challenges that aviation professional’s face by helping us to level the playing field, and working with us to protect the airline pilot profession. We ask that congress be a partner to the men and woman who make up the professionals who move America every day, as well as the companies who employ us. Working together we can ensure that the flight crews of the future will be the best and the brightest, and will have the experience and training necessary to ensure safe air travel to each and every passenger they carry.